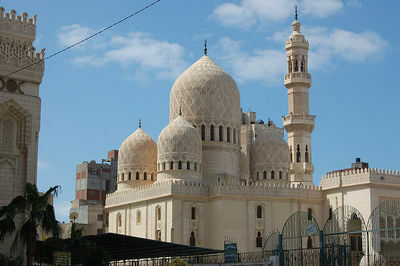 The Al-Mursi Abu'l Abbas mosque, Alexandria, Egypt -- Photograph 2008 Via Wikimedia Commons. In the aftermath of Egypt's revolution, many moderate Muslims have expressed anxiety over the influence of the fundamentalist Muslim Brotherhood in the country's political and social life, while human-rights monitors have warned against discrimination and attacks on the Coptic Christian minority. But another long-feared circumstance has emerged in the land on the Nile. Islamic fundamentalists inspired by the extremist Wahhabi sect have demolished shrines in mosques controlled by Sufis, the spiritual and mystical brotherhoods that have long maintained a prominent presence in Egyptian life. According to the authoritative newspaper Al-Masry Al-Youm (Today's Egyptian), 16 historic mosques in Alexandria belonging to Sufi orders have been marked for destruction by so-called 'Salafis'. The newspaper notes that Alexandria has 40 mosques associated with Sufis, and is the headquarters for 36 Sufi groups. Half a million Sufis live in the city, out of a municipal total of four million people. The 'Salafis' are radical fundamentalists, following the doctrines of Wahhabism as well as South Asian Deobandism and other forms of jihadism, which condemn Sufis for praying at monuments associated with saintly Muslims of the past. In calling themselves 'Salafis', the radicals have committed a double theft of historical precedent. First, they claim to emulate the 'aslaf' or companions and successors to the Prophet Muhammad, living in the early Islamic period. Second, they have appropriated the 'Salafi' label from a group of 19th century Muslim reformers who, although opposed to Sufism, were not jihadist, and unlike 'Salafis' now, did not preach the exclusion from Islam of Muslims with whom they disagreed, a practice known as 'takfir'. But recent 'Salafi' fanatics, like their Wahhabi forebears, insist they are the personification of pure Islam, and commit violence against Shia Muslims as well as Sufis, who may be either Sunni or Shia. Egyptian Sufis and other moderates usually refer to the present-day 'Salafis' simply as 'Wahhabis'. Aggression against the Sufis in Egypt has included a raid on Alexandria's most distinguished mosque, named for, and housing, the tomb of the 13th century Sufi Al-Mursi Abu'l Abbas. Born in the then-Muslim city of Murcia in southeastern Spain, Al-Mursi emigrated to Alexandria. He was a disciple of and successor to the Sufi sheikh Abu'l Hassan Al-Shadhili, founder of the powerful Shadhili Sufi order, which remains influential throughout North Africa, South Asia, the Muslim communities of the Indian Ocean, and Indonesia. Radical fundamentalists have alleged that Sufis are agents of the West as well as heretics. The extremists want to take control of Sufi mosques, after they destroy shrines within their precincts. One object of their manoeuvres is the Qaed Ibrahim mosque in Alexandria, which was the site of mass protests, involving thousands of people, coordinated with those in Cairo's Tahrir Square, during the movement against ex-president Hosni Mubarak. Alexandrian Sufi leader sheikh Gaber Kasem Al-Kholy noted 'Coptic Christians are a main target for those extremists, but we need to speak out about the suffering of the Sufi people'. He said 'We have a considerable number of followers, and we are willing and able to protect Egypt's legacy'. Devastation of Sufi shrines in Alexandria has already led to demonstrations in the city against the fundamentalist wrecking operations. Al-Kholy has announced that local committees would be formed to protect Sufi sites, and distributed forms soliciting youth to serve as volunteers. He said the Sufis have submitted a memorandum to the Egyptian military enumerating 20 Sufi institutions that had been attacked. On Tuesday, April 5, according to Al-Masry Al-Youm, Sufi sheikh Mohamed Alaa Abul Azayem, of the Azeemia Sufi order, warned of sectarian conflict between the mystics and the fundamentalists. The Azeemia order announced at a seminar that it would found an 'Egyptian Liberation Party' to combat both the Muslim Brotherhood and the 'Salafi' fundamentalists if either took power and threatened the Sufis. The political project has also involved members of the National Association for Change, the reformist Ibn Khaldun Center, and the Islamic Popular Leadership Organisation. In addition, Sufi residents of the Egyptian governorates of Al-Minufiya and Aswan have entered complaints with the government's Ministry of Islamic Endowments and public prosecutors, demanding state protection for Sufi structures, against radical encroachment. Radicals in Al-Minufiya had previously assaulted Coptic citizens. Violation of Sufi rights has also been reported in the Al-Buhayra governorate. In the governorate of Al-Qalyubiya, two fundamentalists were arrested at the end of March after a group of their followers razed five local shrines. Fighting broke out with townspeople who gathered to protect the tombs. Egyptian Sufis have described themselves as 'soldiers of God' responsible for the defence of shrines and tombs. A protest against radical violence was called last week by Egypt's Supreme Council of Sufi Orders, at the Hussein Mosque in Cairo, and was joined by a leader of the Shia Muslim minority, Muhammad Al-Derini.